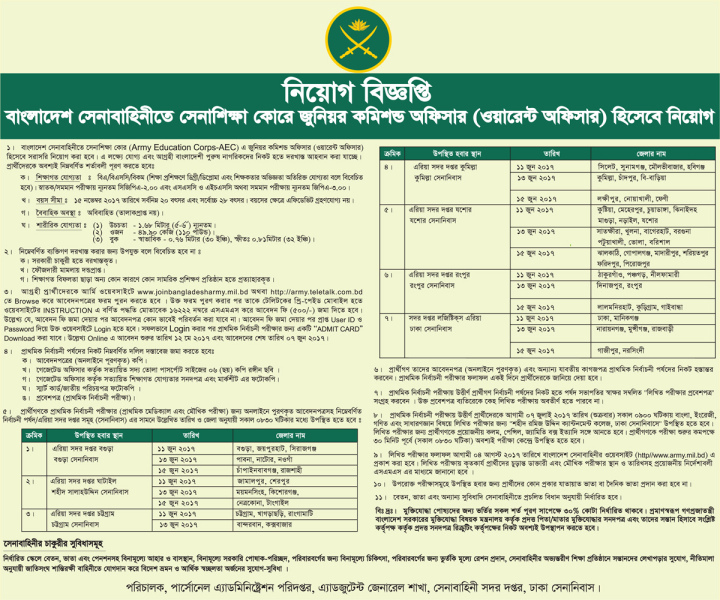 Bangladesh Army Job Circular 2018. www.joinbangladesharmy.mil.bd circular 2018. Join Bangladesh Army 2018 application form, admit card, Result, Officer, Sainik, Solider. BD Army has published a new job circular for officer post. In Bangladesh, every year appointed new solider, officer. And they are the real fighter in Bangladesh. They always support of Bangladesh security defence strategies. It is a difficult question that how to apply it. How to download admit card, check result and many others. By this post, we will tell you everything A to Z information. This circular is publish for Army Education Crops-AEC. They decided that they will appoint Junior Commision Officer (Warrent Officer). Interested candidate must be male or female citizen of Bangladesh. They must be fill up all requirements in this circular. Here we are telling you all requirements step by step. Education Qualification: You must be get minimum CGPA 2.00 and 3.00 in SSC and HSC Examination. Age Limit: In 15th November 2018 you age must be minimum 20 and maximum 28 years. Body Qualification: Height must be 1.68 meters or (5.6′), Weight : 49.90 KG (110 pound), Brest Size: Normal 076 meters (30 Inch). Get more information, see the Circular below. If you want to select, you must be fill up their requirements. Otherwisw you should be uneligible. Here we are telling you, why you will be Uneligible. If you have any legal Case. Without education reason, if you will have been any Exclamation.